Though Córdoba is smaller than Sevilla and lacking the fame associated with Granada’s majestic Alhambra, don’t be fooled – Córdoba is a city bursting with life and things to see and do. This enchanting place cannot be missed, and once you wander its streets for yourself, you’ll understand why. In a city where Christians, Jews and Moors used to roam freely, you can now see traces of each of those cultures throughout Córdoba’s twisting, narrow streets. Here’s our list of some things to do in Córodoba, Spain. Many of these ideas are included in our packaged guided tours, but as always, we’d be happy to plan a tailor made tour for you and your group. The possibilities for discovering Andalucía are endless. This is Córdoba’s picturesque and historic town center. Here you’ll find those narrow, winding streets, whitewashed walls and beautiful colored flowerpots lining the streets. La judería is a place to see in Córdoba, and you can easily spend the afternoon walking through this beautiful area. It’s conveniently the exact neighborhood where your hotel will be located if you choose the Flavors of Andalucía tour. You’ll get an exclusive tour of this beautiful historic mosque, built at a time when Muslims were thriving in Spain. 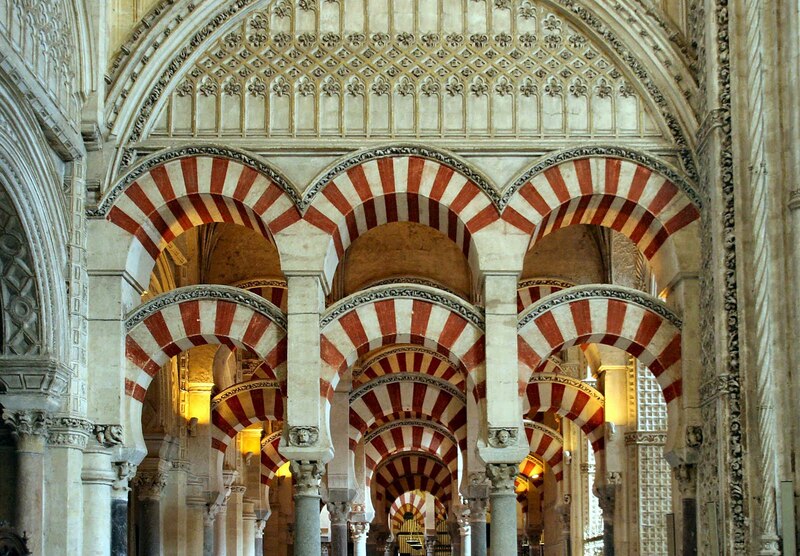 After the Muslims were overthrown by Spain, the Mezquita was transformed back into a cathedral. With the Colors of Andalucía tour, you’ll see both cultures melt together as you walk through this historic building. Located near the Mezquita, you’ll find these awe-striking gardens, sprouting with greenery and bursting with flowers, fountains and beautiful plants. 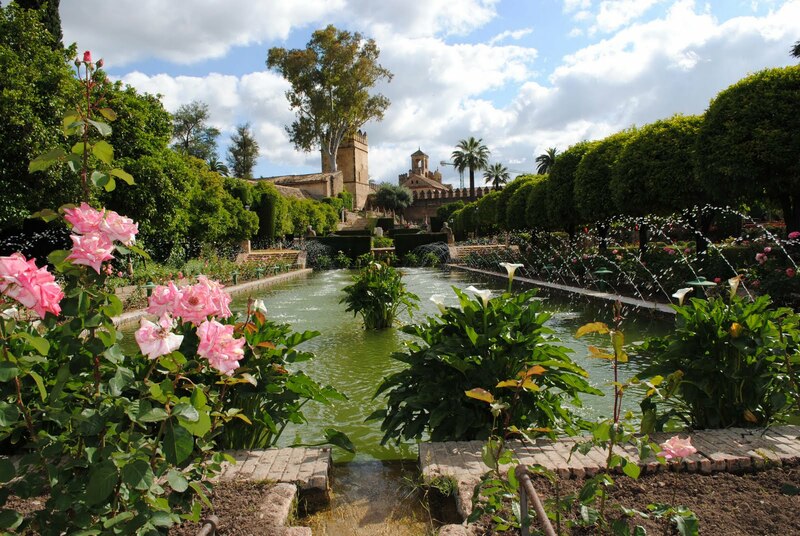 These stunning and sprawling gardens are some of the best things to see in Córdoba. Visit the Alcázar and feel the serenity and beauty surrounding you – it’s enough to take you back in time to when the Arabs ruled most of Spain and Córdoba was the most exciting city in Europe. Experience the true taste of Córdoba by visiting its local tapas restaurants and trying some of the city’s typical food. One of the best things to do in Córdoba is go out for tapas and try as many dishes as possible. We recommend the tortilla de patatas at Bar Santos, and a good bowl of salmorejo, which you’ll be able to find at almost every bar. As part of both the Flavors of Andalucia and Colors of Andalucia guided tours, you’ll be taken to the well-known and respected Montilla-Moriles Vineyard in Córdoba. This is a great thing to do in Córdoba – not everyone gets the chance to visit a Spanish vineyard, and you’ll be getting all kinds of insider information, too. Here you’ll taste the refreshing wine made in this region and learn about the fascinating process of how it’s made. The month of May in Córdoba is a spectacular time to be in the city. As the season quickly shifts to summer, the entire city begins to celebrate. Each week there seems to be a new festival going on. It starts with Las Cruces, then comes Los Patios, and finally, the month finishes with the famous Fería de Mayo. This is a wonderful time to visit the city, and a great way to get a true look into one of Andalucia’s greatest cities. If you’d like further information on these wonderful things to do in Córdoba and within our guided tours, please click here. As always, don’t hesitate to contact us with any questions you have or ideas for your very own tailor made tour.